They are made from 100% Awesome*. (*Awesome made from 100% Cotton.) Heathered colors are a cotton/poly blend while Tri-blend tees are a cotton/poly/rayon mix. Whatever the material it makes for a super soft t-shirt. The weather has been so crazy here over the past few weeks that t-shirts have mostly been to use as layers, but let me tell you as soon as the weather breaks these shirts will be worn constantly. Comfortable, didn’t shrink much when we washed them like many others and we found that both of our boys as well as myself loved how they fit. We were able to get the boys the Unstoppable Dino t-shirts and I got this really awesome Catmouflage t-shirt which I know will be a show stopper when I can wear it out. Any place online that is a one stop shop for our entire family makes me happy. I enjoy being able to hit 1 store and buy for all of us instead of having to jump from website to website and usually getting frustrated because of my lack of extra time. These shirts are affordable and I have a huge wish list for each of us. Another perk for me is that they take PayPal as a form of payment (they accept other methods, too) and I tend to gravitate to companies who accept PayPal. It just works easier for me because while shopping online who wants to go get their debit card?! 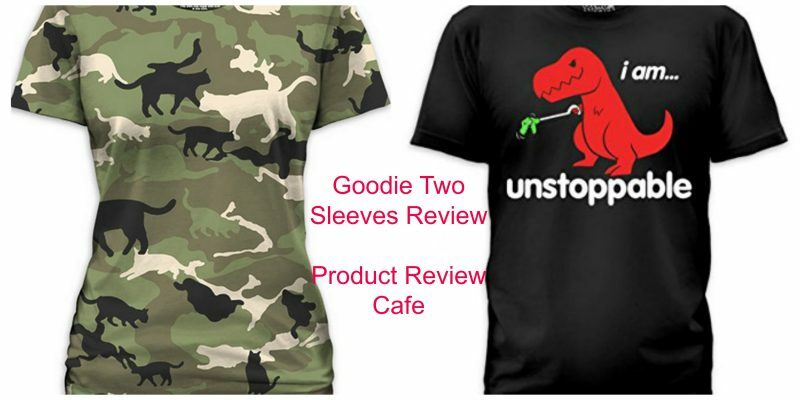 If you are looking for some trendy, clean and funny t-shirts for this spring and summer to update your wardrobe then check out Goodie Two Sleeves for all of your needs. We love them and know you will too! « Perfect Gifts For People Who Are Impossible To Shop For!